When we visit a new country, we usually look at places of interest, which are frequented by tourists. Very rarely visit those unthread path, the things of beauty that are right in front of our eyes, but we somehow just don’t see it in that light. One of those places happen to be the beautiful bridges of a city or town. Kapellbrücke Bridge or the Chapel Bridge, as it is popularly called, is one such gorgeous bridge. 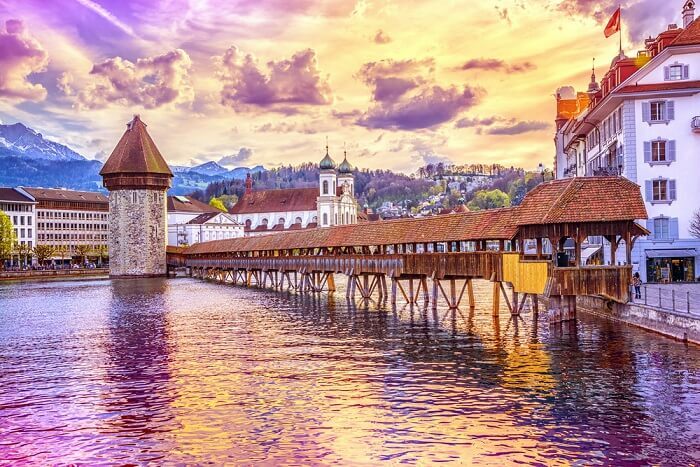 Located in Lucerne, Switzerland, the mesmerising beauty of this bridge attracts tourists from far and wide these days. 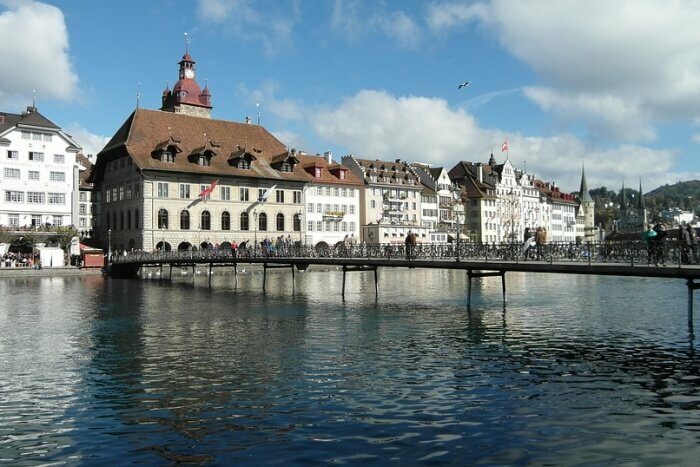 This pretty-looking bridge is a wooden pedestrian bridge, spanning across the Reuss River in the city of Lucerne. The bridge was named after the St. Peter’s Chapel, which is the vicinity. The bridge, is one of the oldest in whole of Europe as it was built way back in 1333. The bridge, which was actually over 200 meters long, shortened in time though, and is now only 170 meters, since the bank was replenished from time to time. The reason that this bridge was built was to connect the Old Town to the New Town. The Lucerne Chapel bridge paintings are another reason that it so unique. This might be one of the very bridges in the world where the paintings can be found under the roof. 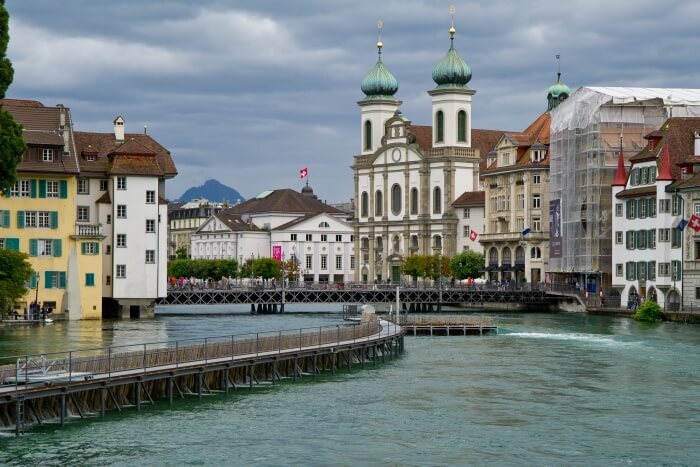 It was painted by a local painter by the name of Hans Heinrich Wagmann and showcase events from the history books of Lucerne as well as those of the patron saints of Lucerne, St. Leger and St. Maurice, among others. An unfortunate event, a fire on the bridge in 1993, destroyed most of the paintings. If you wish to look at these paintings, which is lined up all across the bridge, in triangular wooden blocks, then you need to avoid visiting it from Late January to Early February, as those are the carnival days, and all the old paintings are with modern ones with the carnival theme. Yet another landmark is the Water Tower, and it literally stands on the water. This tower was previously a prison, but is now used as a club room and that is also the reason why it is not open to the public. What makes the Chapel Bridge more charming is the colourful flowers, blooming on either side of the bridge. Of course, the first thing you need to do while you are at Chapel Bridge is to walk across the length of it and admire those old paintings that made it through the fire. Standing over the bridge and looking down at your reflection in the Reuss River gives you so much of peace and solitude. But, those are not the only things that you could do. There are many interesting stuff to explore, which are nearby to this impressive bridge. 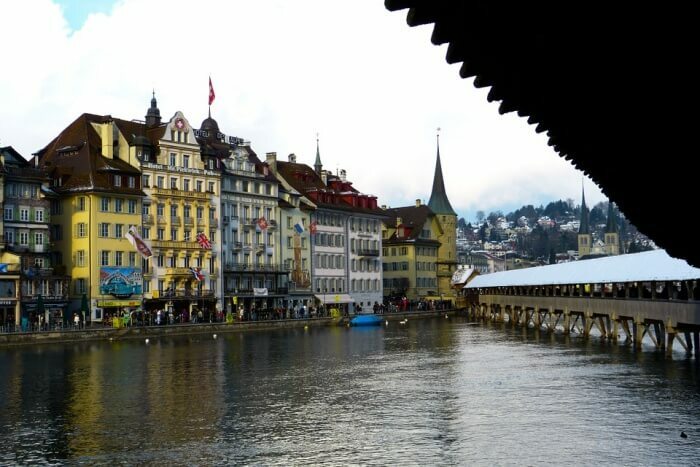 Called as Altstadt, The Old Town of Lucerne is a charming little place to stroll around in. Right across the Chapel Bridge from the new part of the town, it is pretty and just filled with so many little things that you will see along the way and appreciate. One of the most striking features about the old town are its buildings, which oozes of old-world charm with its ornate decorations and colourful murals. You will see this trend all across the Old Town. Another feature is the old town boulevard, which is located right between the Chapel Bridge and the City Hall. A strip, along the river Reuss, it is brimming with restaurants, quaint and with one of the best views of the river. What more could one ask for! This is where the Chapel Bridge gets its name from. This is right next to the bridge in the Old Town in Lucerne, Switzerland and has stood there for several centuries now. Made mainly of marble, this is Baroque style chapel and a charming one at that. The exterior walls of the church have some interesting pieces of art that an art aficionado in you would truly appreciate. An alabaster carving of the Mount of Olives, the fresco of Brother Klaus which dates back to the late 19th century, and also a painting of St. Christopher from the early 20th century is what covers the exterior of this chapel. This background also provides for some great pictures; memories that you can take back home. You could also pray in complete peace in this cute little church. It is a place worth visiting when you are on the bridge. 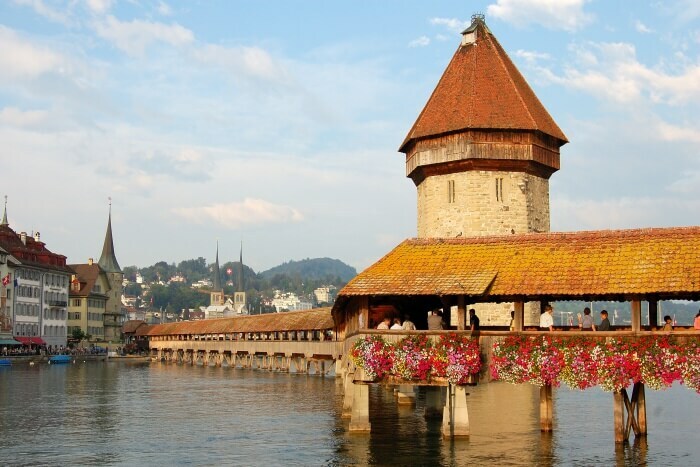 The Lucerne wall and its nine towers stand tall in the Old Town and quite close to the Chapel Bridge. Out of the nine, only four are open to the public, in the months of April through November. 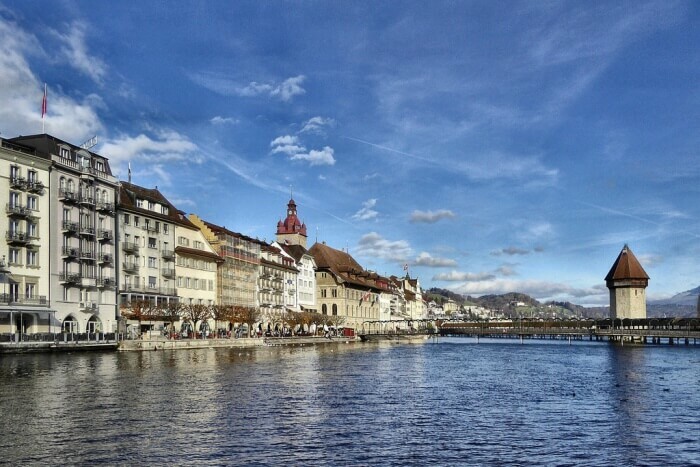 The Musegg Wall and Männli, Zyt, Wacht and Schirmer Towers, offer a fascinating view of the charming city, along with River Seuss and its bay area. It is truly a sight to behold. But, what is interesting about these nine towers is the fact that each one is unique from the other, in the way it was or being used. While two of the towers were used to store gunpowder in the olden days, some of the towers are used by various guilds these days. 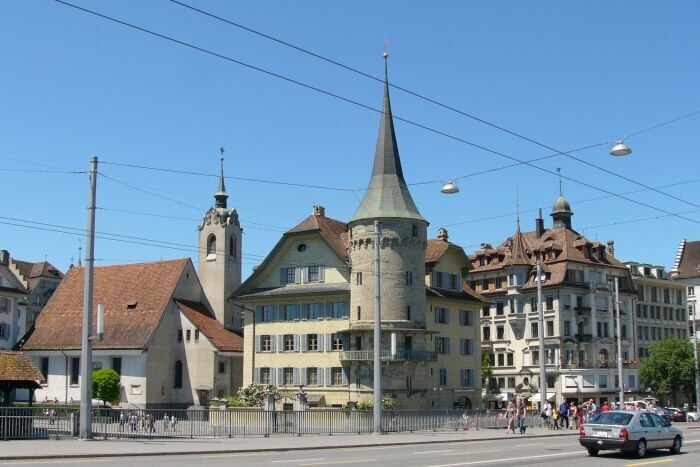 One of the most interesting towers is the Zyt Tower, which houses an exhibition of historic clocks, starting from the late Middle Ages to the 20th century. These were the clocks which were actually made in this city and there are charts, which explain how these clocks evolved over the years. The facts and the exhibitions itself is so fascinating! One of the other towers, the Luegisland Tower, served as a watchtower at one point of time. Even now, you can see a weathercock pointing left to right, high on the roof and it is the tallest among all the towers. Just five minutes from the Chapel Bridge, is yet another bridge called the Spreuer Bridge. This is where you will see the last of these kind of dams called the needle dam. It is a fascinating work of engineering and you will be glad that you actually did not miss out on this. The dam was built between 1859 and 1861, and is also known as Reuss Weir. Believe it or not, but the water level in the city is still regulated by the removal or insertion of these timber needles, which is what holds the dam together, and all this is done manually. If you get to see the men at work there, levelling the water that enters the town, then consider yourself truly lucky! It is a cultural monument of sorts in this part of the town and you can see it in all its glory when you stand on the Chapel Bridge itself. But, the town hall is definitely worth a visit. It was built between 1602 and 1606 by an Italian architect by the name of Anton Isenmann and that is why it is constructed with the look and feel of Italian Renaissance. What was once a trading hall, is now used for exhibitions and concerts. The coffered ceiling, the paintings and just about everything about this place is so gorgeous and takes you back to the Renaissance period of grandeur and rich art forms. A part of the town hall is also used for weddings now, as the registry is located there too. The most interesting part lies in the attic, which is the dovecote, where the doves are bred. This is open to the public, where from a distance, you can observe this gentle bird going about its daily routine. There is also an exhibition, which throws focus on these birds; their behaviour and history. Further Read: Behold These 10 Magnificent Switzerland Waterfalls That Will Blow Your Mind For Sure! As far as Kapellbrücke Bridge is concerned, these fascinating places surround it and all of these are worth a visit. 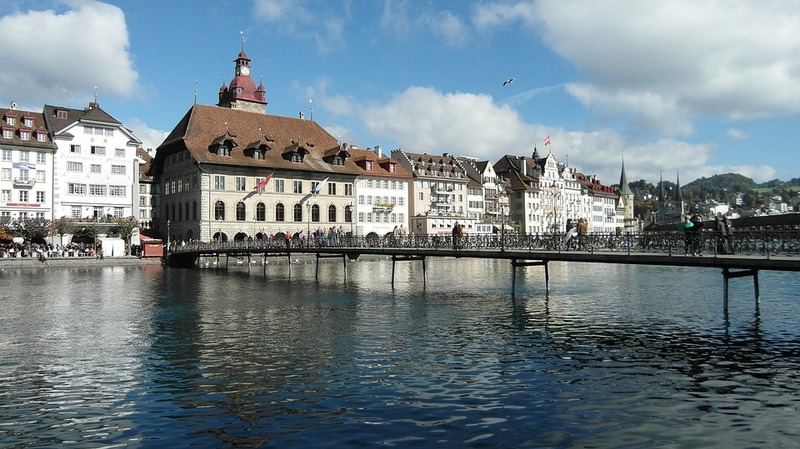 But, Lucerne is not just about the Chapel Bridge. 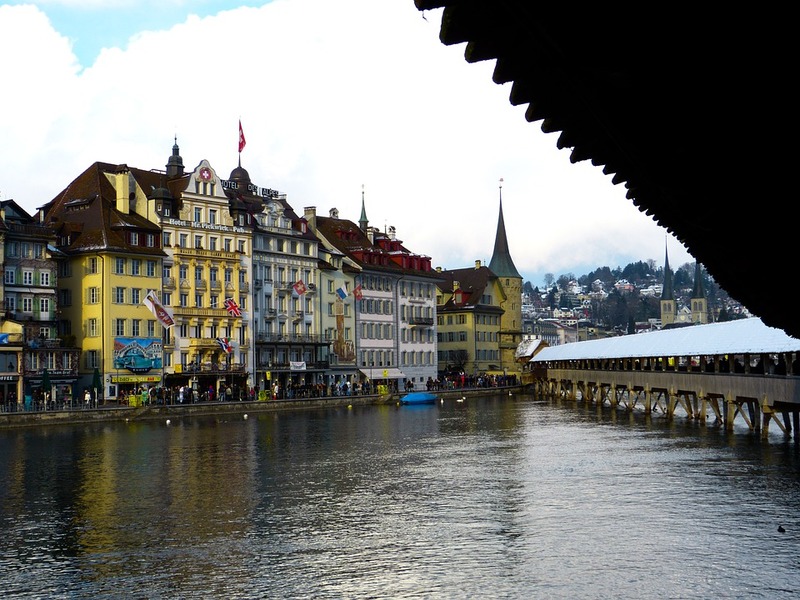 Explore the Lucerne Lake promenade or visit the weekly market in the Old Town. There are so many things to do here. So, plan a trip to Switzerland and soak in all the soothing vibes that this place has to offer with your loved ones!